The pedestrian realm in Cincinnati, and in other American cities alike, has a history of compromise and hostile takeover. Spaces like sidewalks are the basis for traveling through cities and towns by foot. But any terrain assigned for purposes of travel or transport can be pedestrian space. The state of commerce creates substantial space for motorized transport, while pedestrian infrastructure is relegated to sidewalks and footpaths. Once, the pedestrian took advantage of the entire roadway and shared it with other non-motorized transport. In Cincinnati, we are fortunate to have a rich spatial and architecture heritage. However, many have shown concern that Cincinnati lacks an identity or cultural heritage, save for its hyper-centrism on its neighborhoods. However, the city could very well spark a return to a rich, celebrated heritage, in the form of renewed commitment to walkability. Cincinnati’s terrain has always made it challenging for investment to reach beyond the river basin. Streetcar lines facilitated development into the hillsides, but even city steps made travel easier from one isolated hillside community to a commercial district or neighboring community. Alleys were utilized in Cincinnati’s early days to enable rear access to thousands of buildings in its earlier neighborhoods. But certainly, they were also places were food waste and vermin wasted away, much like the streets and sidewalks of the time. 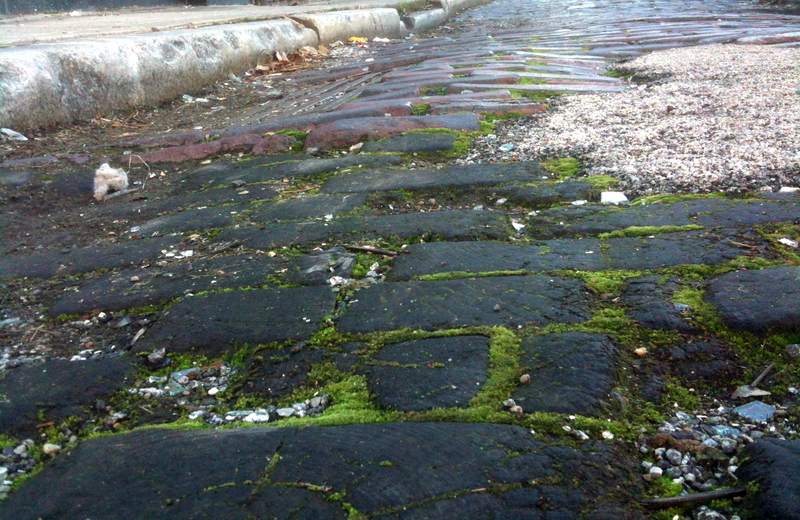 Many miles of sidewalks regularly receive maintenance from the city, but many experienced years or decades of neglect. The site aims to fuse cleanup projects of these pedestrian spaces and education of their history and potential future. The intermediate result will be greater utility of these spaces, breathing new life into areas of the city that have somehow been overlooked. The desired future result is reinvestment and continued maintenance of this infrastructure. Cincinnati deserves a rich cultural history versed in great choice and great mobility. And it has a story to tell. Let’s give back. This entry was posted on December 15, 2011 by C. Huelsman in Alleys.